Acts 16:9 A vision appeared to Paul in the night. There was a man of Macedonia standing, begging him, and saying, "Come over into Macedonia and help us." Acts 16:10 When he had seen the vision, immediately we sought to go out to Macedonia, concluding that the Lord had called us to preach the Good News to them. Acts 16:12 and from there to Philippi, which is a city of Macedonia, the foremost of the district, a Roman colony. We were staying some days in this city. Acts 18:5 But when Silas and Timothy came down from Macedonia, Paul was compelled by the Spirit, testifying to the Jews that Jesus was the Christ. Acts 19:21 Now after these things had ended, Paul determined in the spirit, when he had passed through Macedonia and Achaia, to go to Jerusalem, saying, "After I have been there, I must also see Rome." Acts 19:22 Having sent into Macedonia two of those who served him, Timothy and Erastus, he himself stayed in Asia for a while. Acts 20:1 After the uproar had ceased, Paul sent for the disciples, took leave of them, and departed to go into Macedonia. Acts 20:3 When he had spent three months there, and a plot was made against him by Jews as he was about to set sail for Syria, he determined to return through Macedonia. Romans 15:26 For it has been the good pleasure of Macedonia and Achaia to make a certain contribution for the poor among the saints who are at Jerusalem. 1 Corinthians 16:5 But I will come to you when I have passed through Macedonia, for I am passing through Macedonia. 2 Corinthians 1:16 and by you to pass into Macedonia, and again from Macedonia to come to you, and to be sent forward by you on my journey to Judea. 2 Corinthians 2:13 I had no relief for my spirit, because I didn't find Titus, my brother, but taking my leave of them, I went out into Macedonia. 2 Corinthians 7:5 For even when we had come into Macedonia, our flesh had no relief, but we were afflicted on every side. Fightings were outside. Fear was inside. 2 Corinthians 9:2 for I know your readiness, of which I boast on your behalf to them of Macedonia, that Achaia has been prepared for a year past. Your zeal has stirred up very many of them. 2 Corinthians 11:9 When I was present with you and was in need, I wasn't a burden on anyone, for the brothers, when they came from Macedonia, supplied the measure of my need. In everything I kept myself from being burdensome to you, and I will continue to do so. Philippians 4:15 You yourselves also know, you Philippians, that in the beginning of the Good News, when I departed from Macedonia, no assembly shared with me in the matter of giving and receiving but you only. 1 Thessalonians 1:7 so that you became an example to all who believe in Macedonia and in Achaia. 1 Thessalonians 1:8 For from you the word of the Lord has been declared, not only in Macedonia and Achaia, but also in every place your faith toward God has gone out; so that we need not to say anything. A country lying to the North of Greece, afterward enlarged and formed into a Roman province; it is to the latter that the term always refers when used in the New Testament. I. The Macedonian People and Land. Ethnologists differ about the origin of the Macedonian race and the degree of its affinity to the Hellenes. But we find a well-marked tradition in ancient times that the race comprised a Hellenic element and a non-Hellenic, though Aryan, element, closely akin to the Phrygian and other Thracian stocks. 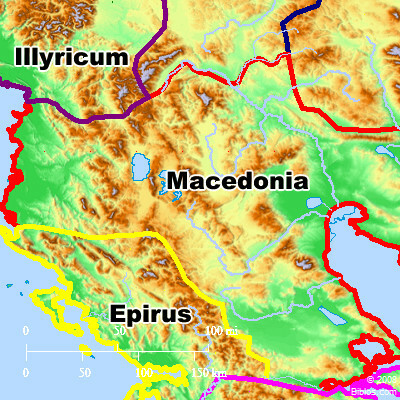 The dominant race, the Macedonians in the narrower sense of the term, including the royal family, which was acknowledged to be Greek and traced its descent through the Temenids of Argos back to Heracles (Herodotus v.22), settled in the fertile plains about the lower Haliacmon (Karasu or Vistritza) and Axius (Vardar), to the North and Northwest of the Thermaic Gulf. Their capital, which was originally at Edessa or Aegae (Vodhena), was afterward transferred to Pella by Philip II. The other and older element-the Lyncestians, Orestians, Pelagonians and other tribes-were pushed back northward and westward into the highlands, where they struggled for generations to maintain their independence and weakened the Macedonian state by constant risings and by making common cause with the wild hordes of Illyrians and Thracians, with whom we find the Macedonian kings in frequent conflict. In order to maintain their position they entered into a good understanding from time to time with the states of Greece or acknowledged temporarily Persian suzerainty, and thus gradually extended the sphere of their power. Herodotus (viii.137-39) traces the royal line from Perdiccas I through Argaeus, Philip I, Aeropus, Alcetas and Amyntas I to Alexander I, who was king at the time of the Persian invasions of Greece. He and his son and grandson, Perdiccas II and Archelaus, did much to consolidate Macedonian power, but the death of Archelaus (399 B.C.) was followed by 40 years of disunion and weakness. With the accession of Philip II, son of Amyntas II, in 359 B.C., Macedonia came under the rule of a man powerful alike in body and in mind, an able general and an astute diplomatist, one, moreover, who started out with a clear perception of the end at which he must aim, the creation of a great national army and a nation-state, and worked consistently and untiringly throughout his reign of 23 years to gain that object. He welded the Macedonian tribes into a single nation, won by force and fraud the important positions of Amphipolis, Pydna, Potidaea, Olynthus, Abdera and Maronea, and secured a plentiful supply of gold by founding Philippi on the site of Crenides. Gradually extending his rule over barbarians and Greeks alike, he finally, after the battle of Chaeronea (338 B.C. ), secured his recognition by the Greeks themselves as captain-general of the Hellenic states and leader of a Greco-Macedonian crusade against Persia. On the eve of this projected eastern expedition, however, he was assassinated by order of his dishonored wife Olympias (336 B.C. ), whose son, Alexander the Great, succeeded to the throne. After securing his hold on Thrace, Illyria and Greece, Alexander turned eastward and, in a series of brilliant campaigns, overthrew the Persian empire. The battle of the Granicus (334 B.C.) was followed by the submission or subjugation of most of Asia Minor. By the battle of Issus (333), in which Darius himself was defeated, Alexander's way was opened to Phoenicia and Egypt; Darius' second defeat, at Arbela (331), sealed the fate of the Persian power. Babylon, Susa, Persepolis and Ecbatana were taken in turn, and Alexander then pressed eastward through Hyrcania, Aria, Arachosia, Bactria and Sogdiana to India, which he conquered as far as the Hyphasis (Sutlej): thence he returned through Gedrosia, Carmania and Persis to Babylon, to make preparations for the conquest of Arabia. A sketch of his career is given in 1 Maccabees 1:1-7, where he is spoken of as "Alexander the Macedonian, the son of Philip, who came out of the land of Chittim" (1:1): his invasion of Persia is also referred to in 1 Maccabees 6:2, where he is described as "the Macedonian king, who reigned first among the Greeks," i.e. the first who united in a single empire all the Greek states, except those which lay to the West of the Adriatic. It is the conception of the Macedonian power as the deadly foe of Persia which is responsible for the description of Haman in Additions to Esther 16:10 as a Macedonian, "an alien in truth from the Persian blood," and for the attribution to him of a plot to transfer the Persian empire to the Macedonians (verse 14), and this same thought appears in the Septuagint's rendering of the Hebrew Agagite (`aghaghi) in Esther 9:24 as Macedonian (Makedon). Alexander died in June 323 B.C., and his empire fell a prey to the rivalries of his chief generals (1 Maccabees 1:9); after a period of struggle and chaos, three powerful kingdoms were formed, taking their names from Macedonia, Syria and Egypt. Even in Syria, however, Macedonian influences remained strong, and we find Macedonian troops in the service of the Seleucid monarchs (2 Maccabees 8:20). In 215 King Philip V, son of Demetrius II and successor of Antigonus Doson (229-220 B.C. ), formed an alliance with Hannibal, who had defeated the Roman forces at Lake Trasimene (217) and at Cannae (216), and set about trying to recover Illyria. After some years of desultory and indecisive warfare, peace was concluded in 205, Philip binding himself to abstain from attacking the Roman possessions on the East of the Adriatic. The Second Macedonian War, caused by a combined attack of Antiochus III of Syria and Philip of Macedon on Egypt, broke out in 200 and ended 3 years later in the crushing defeat of Philip's forces by T. Quinctius Flamininus at Cynoscephalae in Thessaly (compare 1 Maccabees 8:5). By the treaty which followed this battle, Philip surrendered his conquests in Greece, Illyria, Thrace, Asia Minor and the Aegean, gave up his fleet, reduced his army to 5,000 men, and undertook to declare no war and conclude no alliance without Roman consent. In 179 Philip was succeeded by his son Perseus, who at once renewed the Roman alliance, but set to work to consolidate and extend his power. In 172 war again broke out, and after several Roman reverses the consul Lucius Aemilius Paulus decisively defeated the Macedonians at Pydna in 168 B.C. (compare 1 Maccabees 8:5, where Perseus is called "king of Chittim "). The kingship was abolished and Perseus was banished to Italy. The Macedonians were declared free and autonomous; their land was divided into four regions, with their capitals at Amphipolis, Thessalonica, Pella and Pelagonia respectively, and each of them was governed by its own council; commercium and connubium were forbidden between them and the gold and silver mines were closed. A tribute was to be paid annually to the Roman treasury, amounting to half the land tax hitherto exacted by the Macedonian kings. But this compromise between freedom and subjection could not be of long duration, and after the revolt of Andriscus, the pseudo-Philip, was quelled (148 B.C. ), Macedonia was constituted a Roman province and enlarged by the addition of parts of Illyria, Epirus, the Ionian islands and Thessaly. Each year a governor was dispatched from Rome with supreme military and judicial powers; the partition fell into abeyance and communication within the province was improved by the construction of the Via Egnatia from Dyrrhachium to Thessalonica, whence it was afterward continued eastward to the Nestus and the Hellespont. In 146 the Acheans, who had declared war on Rome, were crushed by Q. Caecilius Metellus and L. Mummius, Corinth was sacked and destroyed, the Achean league was dissolved, and Greece, under the name of Achea, was made a province and placed under the control of the governor of Macedonia. In 27 B.C., when the administration of the provinces was divided between Augustus and the Senate, Macedonia and Achea fell to the share of the latter (Strabo, p. 840; Dio Cassius liii.12) and were governed separately by ex-praetors sent out annually with the title of proconsul. In 15 A.D., however, senatorial mismanagement had brought the provinces to the verge of ruin, and they were transferred to Tiberius (Tacitus, Annals, i.76), who united them under the government of a legatus Augusti pro praetore until, in 44 A.D., Claudius restored them to the Senate (Suetonius, Claudius 25; Dio Cassius lx.24). It is owing to this close historical and geographical connection that we find Macedonia and Achia frequently mentioned together in the New Testament, Macedonia being always placed first (Acts 19:21 Romans 15:26 2 Corinthians 9:2 1 Thessalonians 1:7, 8). Diocletian (284-305 A.D.) detached from Macedonia Thessaly and the Illyrian coast lands and formed them into two provinces, the latter under the name of Epirus Nova. Toward the end of the 4th century what remained of Macedonia was broken up into two provinces, Macedonia prima and Macedonia secunda or salutaris, and when in 395 the Roman world was divided into the western and eastern empires, Macedonia was included in the latter. During the next few years it was overrun and plundered by the Goths under Alaric, and later, in the latter half of the 6th century, immense numbers of Slavonians settled there. In the 10th century a large part of it was under Bulgarian rule, and afterward colonies of various Asiatic tribes were settled there by the Byzantine emperors. In 1204 it became a Latin kingdom under Boniface, marquis of Monferrat, but 20 years later Theodore, the Greek despot of Epirus, founded a Greek empire of Thessalonica. During the 2nd half of the 14th century the greater part of it was part of the Servian dominions, but in 1430 Thessalonica fell before the Ottoman Turks, and from that time down to the year 1913 Macedonia has formed part of the Turkish empire. Its history thus accounts for the very mixed character of its population, which consists chiefly of Turks, Albanians, Greeks and Bulgarians, but has in it a considerable element of Jews, Gypsies, Vlachs, Servians and other races. In the narrative of Paul's journeys as given us in Acts 13-28 and in the Pauline Epistles, Macedonia plays a prominent part. The apostle's relations with the churches of Philippi, Thessalonica, and Berea will be found discussed under those several headings; here we will merely recount in outline his visits to the province. On his 2nd missionary journey Paul came to Troas, and from there sailed with Silas, Timothy and Luke to Neapolis, the nearest Macedonian seaport, in obedience to the vision of a Macedonian (whom Ramsay identifies with Luke: see under the word "Philippi") urging him to cross to Macedonia and preach the gospel there (Acts 16:9). From Neapolis he journeyed inland to Philippi, which is described as "a city of Macedonia, the first of the district" (Acts 16:12). Thence Paul and his two companions (for Luke appears to have remained in Philippi for the next 5 years) traveled along the Ignatian road, passing through Amphipolis and Apollonia, to Thessalonica, which, though a "free city," and therefore technically exempt from the jurisdiction of the Roman governor, was practically the provincial capital. Driven thence by the hostility of the Jews, the evangelists preached in Berea, where Silas and Timothy remained for a short time after a renewed outbreak of Jewish animosity had forced Paul to leave Macedonia for the neighboring province of Achaia (Acts 17:14). Although he sent a message to his companions to join him with all speed at Athens (Acts 17:15), yet so great was his anxiety for the welfare of the newly founded Macedonian churches that he sent Timothy back to Thessalonica almost immediately (1 Thessalonians 3:1, 2), and perhaps Silas to some other part of Macedonia, nor did they again join him until after he had settled for some time in Corinth (Acts 18:5 1 Thessalonians 3:6). The rapid extension of the Christian faith in Macedonia at this time may be judged from the phrases used by Paul in his 1st Epistle to the Thessalonians, the earliest of his extant letters, written during this visit to Corinth. He there speaks of the Thessalonian converts as being an example "to all that believe in Macedonia and in Achaia" (1 Thessalonians 1:7), and he commends their love "toward all the brethren that are in all Macedonia" (1 Thessalonians 4:10). Still more striking are the words, "From you hath sounded forth the word of the Lord, not only in Macedonia and Achaia, but in every place your faith to God-ward is gone forth" (1 Thessalonians 1:8). On his 3rd missionary journey, the apostle paid two further visits to Macedonia. During the course of a long stay at Ephesus he laid plans for a 2nd journey through Macedonia and Achaia, and dispatched two of his helpers, Timothy and Erastus, to Macedonia to prepare for his visit (Acts 19:21, 22). Some time later, after the uproar at Ephesus raised by Demetrius and his fellow-silversmiths (Acts 19:23-41), Paul himself set out for Macedonia (Acts 20:1). Of this visit Luke gives us a very summary account, telling us merely that Paul, "when he had gone through those parts, and had given them much exhortation,.... came into Greece" (Acts 20:2); but from 2 Cor, written from Macedonia (probably from Philippi) during the course of this visit, we learn more of the apostle's movements and feelings. While at Ephesus, Paul had changed his plans. His intention at first had been to travel across the Aegean Sea to Corinth, to pay a visit from there to Macedonia and to return to Corinth, so as to sail direct to Syria (2 Corinthians 1:15, 16). But by the time at which he wrote the 1st Epistle to the Corinthians, probably near the end of his stay at Ephesus, he had made up his mind to go to Corinth by way of Macedonia, as we have seen that he actually did (1 Corinthians 16:5, 6). From 2 Corinthians 2:13 we learn that he traveled from Ephesus to Troas, where he expected to find Titus. Titus, however, did not yet arrive, and Paul, who "had no relief for (his) spirit," left Troas and sailed to Macedonia. Even here the same restlessness pursued him: "fightings without, fears within" oppressed him, till the presence of Titus brought some relief (2 Corinthians 7:5, 6). The apostle was also cheered by "the grace of God which had been given in the churches of Macedonia" (2 Corinthians 8:1); in the midst of severe persecution, they bore their trials with abounding joy, and their deep poverty did not prevent them begging to be allowed to raise a contribution to send to the Christians in Jerusalem (Romans 15:26 2 Corinthians 8:2-4). Liberality was, indeed, from the very outset one of the characteristic virtues of the Macedonian churches. The Philippians had sent money to Paul on two occasions during his first visit to Thessalonica (Philippians 4:16), and again when he had left Macedonia and was staying at Corinth (2 Corinthians 11:9 Philippians 4:15). On the present occasion, however, the Corinthians seem to have taken the lead and to have prepared their bounty in the previous year, on account of which the apostle boasts of them to the Macedonian Christians (2 Corinthians 9:2). He suggests that on his approaching visit to Achaia he may be accompanied by some of these Macedonians (2 Corinthians 9:4), but whether this was actually the case we are not told. The 3rd visit of Paul to Macedonia took place some 3 months later and was occasioned by a plot against his life laid by the Jews of Corinth, which led him to alter his plan of sailing from Cenchrea, the eastern seaport of Corinth, to Syria (2 Corinthians 1:16 Acts 20:3). He returned to Macedonia accompanied as far as Asia by 3 Macedonian Christians-Sopater, Aristarchus and Secundus-and by 4 from Asia Minor. Probably Paul took the familiar route by the Via Egnatia, and reached Philippi immediately before the days of unleavened bread; his companions preceded him to Troas (Acts 20:5), while he himself remained at Philippi until after the Passover (Thursday, April 7, 57 A.D., according to Ramsay's chronology), when he sailed from Neapolis together with Luke, and joined his friends in Troas (Acts 20:6). Toward the close of his 1st imprisonment at Rome Paul planned a fresh visit to Macedonia as soon as he should be released (Philippians 1:26; Philippians 2:24), and even before that he intended to send Timothy to visit the Philippian church and doubtless those of Berea and Thessalonica also. Whether Timothy actually went on this mission we cannot say; that Paul himself went back to Macedonia once more we learn from 1 Timothy 1:3, and we may infer a 5th visit from the reference to the apostle's stay at Troas, which in all probability belongs to a later occasion (2 Timothy 4:13). Of the churches of Macedonia in general, little need be said here. A striking fact is the prominence in them of women, which is probably due to the higher social position held by women in this province than in Asia Minor (Lightfoot, Philippians4, 55;). We find only two references to women in connection with Paul's previous missionary work; the women proselytes of high social standing take a share in driving him from Pisidian Antioch (Acts 13:50), and Timothy's mother is mentioned as a Jewess who believed (Acts 16:1). But in Macedonia all is changed. To women the gospel was first preached at Philippi (Acts 16:13); a woman was the first convert and the hostess of the evangelists (Acts 16:14, 15); a slave girl was restored to soundness of mind by the apostle (Acts 16:18), and long afterward Paul mentions two women as having "labored with (him) in the gospel" and as endangering the peace of the church by their rivalry (Philippians 4:2, 3). At Thessalonica a considerable number of women of the first rank appear among the earliest converts (Acts 17:4), while at Berea also the church included from the outset numerous Greek women of high position (Acts 17:12). The bond uniting Paul and the Macedonian Christians seems to have been a peculiarly close and affectionate one. Their liberality and open-heartedness, their joyousness and patience in trial and persecution, their activity in spreading the Christian faith, their love of the brethren-these are a few of the characteristics which Paul specially commends in them (1 and 2 Thessalonians; Philippians; 2 Corinthians 8:1-8), while they also seem to have been much freer than the churches of Asia Minor from Judaizing tendencies and from the allurements of "philosophy and vain deceit." We know the names of a few of the early members of the Macedonian churches-Sopater (Acts 20:4) or Sosipater (Romans 16:21: the identification is a probable, though not a certain, one) of Berea; Aristarchus (Acts 19:29; Acts 20:4; Acts 27:2 Colossians 4:10 Philemon 1:24), Jason (Acts 17:5-9 Romans 16:21) and Secundus (Acts 20:4) of Thessalonica; Clement (Philippians 4:3), Epaphroditus (Philippians 2:25; Philippians 4:18), Euodia (Philippians 4:2; this, not Euodias (the King James Version), is the true form), Syntyche (same place), Lydia (Acts 16:14, 40; a native of Thyatira), and possibly Luke (Ramsay, Paul the Traveler, 201;) of Philippi. Gaius is also mentioned as a Macedonian in Acts 19:29, but perhaps the reading of a few manuscripts Makedona is to be preferred to the Textus Receptus of the New Testament Makedonas in which case Aristarchus alone would be a Macedonian, and this Gaius would probably be identical with the Gaius of Derbe mentioned in Acts 20:4 as a companion of Paul (Ramsay, op. cit., 280). The later history of the Macedonian churches, together with lists of all their known bishops, will be found in Le Quien, Oriens Christianus, II, 1;; III, 1089; 1045 f.
General: C. Nicolaides, Macedonien, Berlin, 1899; Berard, La Macedoine, Paris, 1897; "Odysseus," Turkey in Europe, London, 1900. Secular History: Hogarth, Philip and Alexander of Macedon, London, 1897, and the histories of the Hellenistic period by Holm, Niese, Droysen and Kaerst. Ethnography and Language: O. Hoffmann, Die Makedonen, ihre Sprache und ihr Volkstum, Gottingen, 1906. Topography and Antiquities: Heuzey and Daumet, Mission archeologique de Macedoine, Paris, 1876; Cousinery, Voyage dans la Macedoine, Paris, 1831; Clarke, Travels 4, VII, VIII, London, 1818; Leake, Travels in Northern Greece, III, London, 1835; Duchesne and Bayet, Memoire sur une mission en Macedoine et au Mont Athos, Paris, 1876; Hahn, Reise von Belgrad nach Saloniki, Vienna, 1861. Coins: Head, Historia Nummorum, 193 f; British Museum Catalogue of Coins: Macedonia, etc., London, 1879. Inscriptions: CIG, numbers 1951-2010; CIL, III, 1 and III, Suppl. ; Dimitsas,`H... Athens, 1896. MACEDONIA, a kingdom lying n. of Greece, bounded, in the time of the N.T., n. by the Hae'mus Mts. or the modern Balkan, on the e. by Thrace and AEgean Sea, s. by Achaia (Greece), w. by Epirus and Illyricum, and including part of those districts now called Albania and Roumelia.